Animated gifs can be an effective technique to increase reader engagement by catching the eye of the recipient. There are a number of alternative innovative ways to boost reader engagement, and here are 4 of my favorites in terms of originality and uniqueness. Some of you may have read my post on creating an image carousel in email. 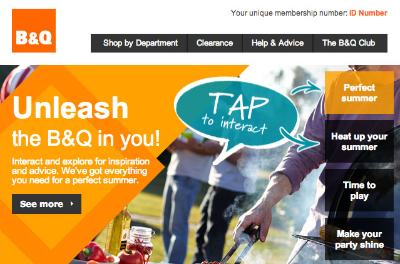 Well B&Q did that and more! The email incorporated a carousel of heroes that were not only responsive, they slide when activated. Very well done and I’m hoping is a sign of more cool interactive emails to come! Read Elliott Ross’ take on it on the Action Rocket blog. 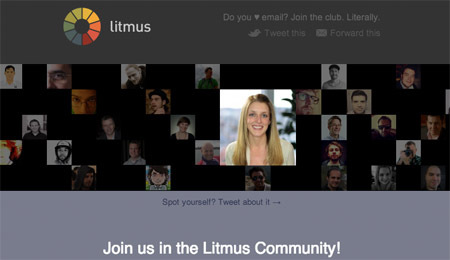 A home for conversations about email design and marketing, Litmus launched their community with an engaging email which emphasizes the people behind their community. Their cool use of rollover and CSS animations achieves a fading and appearing wall of profile pictures which appears in the email itself—check it out here. Taking it to the next level, Litmus promoted their Email Design Conference with a visually impressive email. Their groundbreaking technique displayed a HTML5 video background, which generated an overwhelmingly positive response from their readership. This stylish email accomplished exactly what the marketers intended—increased attention towards their brand. Who said that interactive emails are limited to marketing campaigns? Here is a fun example showing how CSS animation in emails can be used to create an interactive game that is fully contained within the email. The idea behind the game is straightforward, and it sheds some light on how marketers have plenty of room to think out of the box when it comes to creating exciting emails. StyleCampaign experiments with not just Scalable Vector Graphics(SVG) in email, but animated SVG images! A main benefit of SVG is that it you can get nice images that scale to large dimensions with very small file sizes. As you can see from these four examples, there’s a tremendous amount of room for creativity if you’re willing to experiment a little. 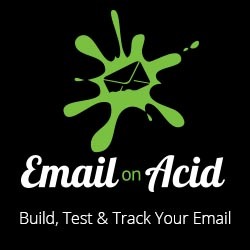 Interactive emails seems to be the new thing, but how are all these examples supported by outlook and other email clients? Also likelihood of it going to the spam folder? Thank you. Hi Andres, most of these examples work on Outlook.com but sadly not the Outlook desktop client. So far I haven’t seen any effects regarding these emails getting into the inbox. thanks for these examples. Indeed, Litmus often pleasantly surprise us with nice and interactive email designs. That’s what they do!